Change. That’s a word that can create mixed emotions when it comes to music. Most of us likes when our favourite artists changes a little bit here and there with every record. Unless you’re AC/DC or Motörhead, we really don’t want our fave bands to sound the same record after record. Whitesnake is good example. Slip Of The Tongue is more or less a carbon copy of 1987 and that album bombed. On the other hand, nobody wants their fave bands to turn 180 degrees and become a completely different act. If anyone knows about the Canadian band Sven Gali, then they’re a good example of just that. Their debut album sounded a lot like Skid Row with some Van Halen thrown in and their look was like many other melodic hard rock bands in 1992. Fast forward three years and the band found themselves in Seattle with new hair cuts and a completely new wardrobe and with a sound so different that you couldn’t hear anything in common with their debut. Even the singer’s voice was unrecognizable. Let’s just say that to change a bit every now and then is healthy thing if you want to develop and not stagnate. So, what is this guy babbling about, you might ask. 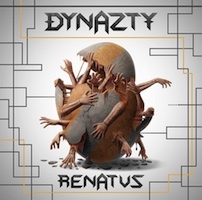 Well, the word “change” is sort of the key word when Sweden’s Dynazty releases their fourth long player Renatus. Not only have they changed record company,from actor Peter Stormare’s label Stormvox to Spinefarm, original bass player and song writer Joel “Fox” Appelgren left the band and was replaced by Jonathan Olsson. Appelgren’s name popped up frequently in the song writing credits on their erlier albums and when this album was being recorded we got the news that a major change of sound would take place. I loved their last album Sultans Of Sin and I really think that both Bring The Thunder and Knock You Down are brilliant outings from this band, so it’s safe to say that I wasn’t really at ease with the news that Dynazty would change their musical ways. But on the other hand, I really believed that these guys are strong enough as both song writers and musicians to not release anything bad, no matter what kind of music they’re playing. I got a little taste of their new style this summer when they showcased a new song live, “Dawn Of Your Creation”, a good song, no doubt, but I was a bit sceptical. It sounded way to modern and rock radio friendly and I wasn’t sure if this would be the right path for the band to choose. Besides, they would also run the risk at being just another bunch with a similar sound as the other bands on the circuit. Well, first single “Starlight” did put all my worries to rest. There’s one thing to change your sound and a whole other world if you change your identity. Two separate things and you can do one without doing the other and thankfully Dynazty’s identity hasn’t changed one bit. The song is brilliant and sounds like a heavier version of their old sound, with just a twist of power metal in the chorus. Opener “Cross The Line” is a real killer that goes into progressive metal territory and some riffs makes me think of Dream Theater and sound wise I can hear bits of James LaBrie’s (Dream Theater) latest solo album Impermanent Resonance. All by coincidence, I’m sure. Then it’s time to make acquaintance with “Dawn Of Your Creation” again, this time in a studio environment and this time the song sticks like glue. It’s a killer song with more hooks than a fisherman’s hat, so catchy it hurts with a lite more modern metal sound and a cool Yngwie Malmsteen break before the guitar solo thrown in for good measure. “The Northern End” blows me away completely. This is my hit of the album. It’s big, bombastic and reminds me of Avantasia at the top of their game and Avantasia comes to mind also in “Incarnation”, only with a more classic Dynazty chorus – brilliant! Both “Run Amok” and “Unholy Deterrent” is pure heavy metal. This is hard stuff and I can’t help but to think this sounds like a modern version of Judas Priest during their Painkiller days and “Sunrise In Hell” is a nod towards power metal. Normally, I have a hard time with power metal, especially the German kind (I love Avantasia, though), but in the hands of Dynazty, the power metal twist fits perfectly. “Salvation” – maybe my favourite song on the album – starts out as a ballad, but turns into a big, epic metal number with an impervious clout. The finishing song, “A Divine Comedy” takes us back to the old style, just with a little more metal to it, an awesome way to end this album. When you feel the need to name drop every single song and praise them all, then you have done something very right. Dynazty has changed their sound, yes, but they have kept their identity intact – it’s quite easy to hear that this is a Dynazty record, to be frank. Also, no matter what people like to call them, they were never a glam / sleaze band. They have always played melodic hard rock with a bucket of metal thrown in. Ok, metal the way Skid Row played it, not Judas Priest, but metal none the less. On this album, they have lost their Whitesnake, Skid Row and Ratt influences and dived right into the sea of Judas Priest and Iron Maiden, but with a more modern and melodic and sing-along-ish vibe, if you will – and the guys have done a terrific job. There’s not one bad track on this album and the production is impeccable, this time done by the band themselves. There have been comparisons with bands like Amaranthe and such, but never mind those – for some people it’s enough to make those comparisons over a change of sound that includes a modern metal twist. This has nothing to do with that kind of music. The addition of keyboards – here quite prominent and played by brilliant guitarists Love Magnusson and Mike Lavér – is a big part of the new sound and one of the reasons that their sound has taken a new turn. Also, Nils Molin keeps growing as a singer. He has always been very good, but the songs here needs a broader range to handle them and Molin never misses a note. So, is this their best album to date? Their previous album Sultans Of Sin was only one song from getting a 10/10 review from me and that song wasn’t bad at all. I can’t say if their new album is better, but I can say that it’s different and equally as good. The way this develops, it would take some kind of miracle not to make them one of the biggest bands Sweden has to offer. We’re being served a dish of the finest metal and it’s all ours for the taking. It’s time to wake up now, world. A very good album. Good job boys!